Finally, I've gotten a challenge finished that I started either Saturday or Sunday. I think Sunday. Anyway, it's been a non stamping week for me. I hate it when that happens! Hopefully I can work more into my weekend! Anyway, this week Create with Connie & Julie gave us a sketch challenge. Here it is if you'd like to play along. Leave a comment and a link if you do-I'd love to see it! Below is my creation. I had the idea in my head all week, but I'm not sure if it came out quite right. ?? I went back to the color combination I loved before with this set: Soft Suede, Not Quite Navy & Very Vanilla. The part I don't like is the Soft Suede layer behind the flower, but not sure what would have worked there. Oh well! The background was done by using Very Vanilla cardstock in the Big Shot with a Texturz plate from the Backgrounds 1 set. After putting through the Big Shot, I ran my brayer over it with Soft Suede ink. Note: I brayered over the indented side, NOT the raised side. I also sponged the edges with Soft Suede ink. Next layer is the F friends image, stamped in Not Quite Navy on Very Vanilla. I stamped another F and cut out to layer over for dimension. I did the vine image stamped off once with Soft Suede and the small flower in Not Quite Navy. Sponged lightly with Soft Suede to soften the Very Vanilla. I tied a Kraft Taffeta ribbon around the right side of this layer. Over that I layered a Soft Suede piece that had been stamped with the vine image in Very Vanilla. Lastly, I added the flower accent. I stamped the Vintage Flower twice, once in Soft Suede, once in Not Quite Navy and cut them out. I attached them together with a Kraft corduroy button sponged with Not Quite Navy ink. Happy Friday all! I'm hoping for a quiet day at work, the Boss is out of town. :) Back soon-I hope! Good Luck also to the Crete Robotics team who are competing this weekend in Omaha. My Freshman son is on one of the teams. 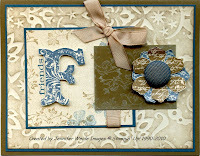 Very pretty, Jennifer...love the vintage colors and feel of your card! Thanks for playing along with Create with Connie and Julie this week! This is beautiful! I especially love the inked embossed background, very nice!! This is simply LOVELY! These colors with this set are GREAT! I also loved how you layered your flowers for the medallion part of the sketch. It is a very pretty card. I wonder if the navy would work better behind the flower instead of the suede or something lighter - maybe it is too dark which detracts from the flower. I would play with it a little more if you don't like it but it is a pretty card. Thanks for sharing it.